"Oh, that one's fine, but you need to watch Brotherhood!" "Brotherhood is so much better. I can take or leave the original." These are the typical responses I get when I proclaim my love for Fullmetal Alchemist. The Fullmetal Alchemist: Brotherhood fans come out of the woodwork and begin to tell me how much better it is. 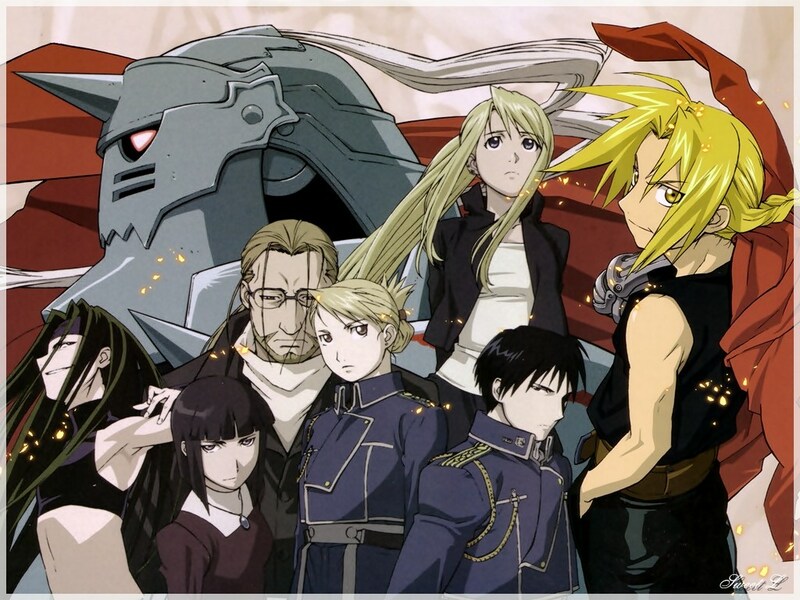 I agree on one point - Fullmetal Alchemist: Brotherhood is excellent (what I've seen of it. Hulu is slow on updating the dubbed version. Ordinarily I'm all for subtitles, but Fullmetal Alchemist is what I watch while drawing, and drawing while reading subtitles is a talent I lack). However today, I'm not here to talk about Fullmetal Alchemist: Brotherhood. I'm going to tell you why you need to watch Fullmetal Alchemist, whether you've seen Brotherhood or not. • It's my favorite anime. I know this might not be a legitimate reason, but really. It's my favorite. On top of that, it's one of my favorite shows in history - and if you knew how picky I am, you would know I do not say this lightly. • It features an extremely well-written relationship between two brothers. One of whom is actually a hollow suit of armor. You have to watch the show. • Roy Mustang. I'm writing him in when I vote this year. Roy Mustang for President 2k16. • Riza Hawkeye. Otherwise known as one of the most badass fictional ladies ever. There are loads of badass ladies here, in fact. Including little girls and grandmothers. They will destroy you. • The seven deadly sins personified as homunculi. Including Envy and Greed, who are strangely lovable in spite of being terrible people. • A complex world with countries, religions, and customs. It's some of the best worldbuilding I've ever seen in anything, period. Even the minor characters are detailed and three-dimensional. • Political intrigue. Plots to cover up massacres. Soldiers who really regret their life choices and seek to rectify them. • Friendships. Friendships everywhere. Friendships between grown men and men and women and women and women and brothers and kids and adults. In fact, there are tons of amazing and excellent relationships of all kinds. • This anime isn't for the faint of heart. Nor is it for those who want something light and fluffy. Although it makes me laugh so hard I cry generally three times an episode, Fullmetal Alchemist explores questions of moral ethics at every turn. It makes you think, and it makes you think hard. And surprisingly, it tends to give excellent answers. A variety of other reasons to watch include: Roy Mustang's sarcasm, Maes Hughes and his flawless too-pure-for-this-world cinnamon roll self, a soundtrack that will stick with you for the rest of your life, scenes that are genuinely terrifying, scenes that are incredibly beautiful, Roy Mustang being useless when it rains, state alchemy exams, Ed Elric being short, dogs (of… various kinds), Armstrong's pink sparkles, a case of tennis elbow that goes straight to the brain, and on-point voice acting for both the subbed and dubbed versions. There are several differences between Fullmetal Alchemist and Fullmetal Alchemist: Brotherhood. They tell the same story in slightly different ways, with different details included or different characters explored at different lengths. But the reasons to watch remain the same. Don't let Fullmetal Alchemist take a back seat! "Roy Mustang being useless when it rains..." :P :D Laughing! PRETTY MUCH ALL OF THIS IS ACCURATE AND I LOVE IT. Also Riza Hawkeye is my role model.